The 76ers unveiled the start date and location of their training camp Friday. They also added four names to their preseason roster. The team signed free agents Dan Gadzuric, Devin Searcy, Xavier Silas and Damien Wilkins to bring their training-camp roster to 17. Camp, by the way, opens Tuesday at Saint Joseph’s University’s Hagan Arena and runs through Saturday, Oct. 6. The Sixers begin their slate of seven preseason games Oct. 11 at Orlando. Gadzuric, a 6-11 forward who has played parts of 10 NBA seasons, was with the Knicks for two games last season. Searcy, an undrafted 6-10 forward who played in Japan last year, got time in five Orlando Summer League games for the Sixers. Silas (pictured), a 6-5 guard, was a 2011 training-camp invitee who spent the bulk of his year with the Sixers’ D-League affiliate in Maine before signing with the team in April for their playoff run. Wilkins, a 6-6 guard who’s been in the league for eight seasons, played in 60 games last season with the Pistons. Monday, Tony DiLeo talked about his new job. Tuesday, he’ll wake up and look to make a hire. There’s no telling when DiLeo will make an addition to the 76ers’ front office, but the newly appointed general manager is looking to do so in the near future. And it’ll be in the analytics category. Still not following along? Basically, the Sixers are looking to do for the NBA what Moneyball has done for baseball. DiLeo wants a guy who can help the team rank draft picks’ worth, put a dollar amount to a player’s contract and break down which players are most productive in the right situations. DiLeo said he’s developed a unique formula of his own to rank players. “I think this all started a couple years ago with the Moneyball phenomenon,” DiLeo said. “In baseball they use it a lot, which is because you have 1-on-1 different statistics. Basketball’s a little more complicated because you have 5-on-5 on the court trying to break that down. “If we can gain an advantage in that area where these players are the best combination out there, or this player is worth this much money, what’s the value of the contracts, or if we make a trade how will it affect our team statistically – because we’re losing this Player A and bringing in this Player B and how it affects our team. In the draft (it could be used) to analyze the characteristics of what made different draft picks successful in the NBA, and what were the key statistics. Andrew Bynum is OK … but his contract isn’t extended. DiLeo said Bynum went to Germany last week and underwent a non-invasive procedure on his knee and won’t miss the opening of camp. However, the bad news was that the Sixers don’t have any news on Bynum’s contract, which expires at the end of this season. Sounds like veteran Josh Howard, a small forward, is in for a two-day tryout. The Sixers are looking to bring at least one guy, maybe two, in for camp at that position. Howard might be one of them. DiLeo said he interviewed in Portland then, after meeting with owner Josh Harris, said he wouldn’t interview elsewhere … even though more than two teams called for permission to do so. DiLeo said he was reassured by Harris that he’d be given serious consideration for the post. This is the second of what will be many posts throughout the Sixers' season -- and beyond. So make sure to bookmark the blog and check back regularly for observations, musings, news and notes. Thanks for stopping by. His phone cut out once. When it cut out a second time, he apologized. Thorn was in a great frame of mind Friday night, after the Sixers announced that they had promoted the guy they expect to take Thorn’s place. The Sixers made senior vice president Tony DiLeo the team’s general manager, the 12th in franchise history. The Sixers fully expect DiLeo to use the upcoming season to glean as much from Thorn as possible before Thorn leaves his post for a more-cozy consultant’s role with the team. “Tony’s capable enough to do the job without me meddling too much,” Thorn said. DiLeo, 57, who enters his 23rd season with the Sixers, has been with the team since 1990 and has served in a variety of capacities in the front office. A former assistant coach, he took over for coach Maurice Cheeks when the Sixers fired him after opening the 2008-09 season with nine wins in 23 games. DiLeo led the Sixers to the playoffs that season, after which he withdrew his name from consideration as full-time coach and returned to a role in management. 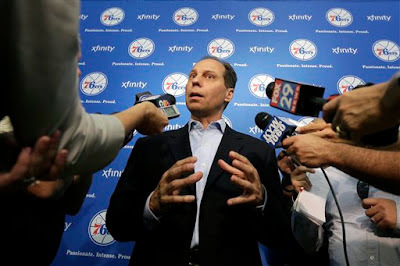 Thorn didn’t confirm particular names of guys the Sixers called in for interviews for the general manager post, but a few have been widely reported. According to a CBS Sports report, they interviewed Tom Penn, a former executive with the Trail Blazers, and Jeff Bower, an ex-Hornets exec, but instead returned to DiLeo. It's also believed the team tried to sit down with Nuggets general manager Masai Ujiri, but Denver's brass nixed those bids by the Sixers. “In terms of the interview process, we interviewed a number of people and got different perspectives,” Thorn said. “We always felt Tony was a strong candidate because of his experience. With his experience, he knows what he's doing. ... At the end of the day, he was going to be our guy." This is the first of what will be many posts throughout the Sixers' season -- and beyond. So make sure to bookmark the blog and check back regularly for observations, musings, news and notes. Thanks for stopping by.